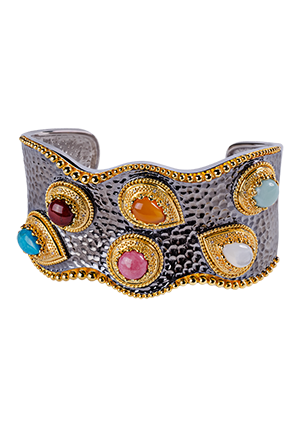 A solid silver bracelet with semi-precious stones. Semi-precious stones in a gilded, round or teardrop-shaped gallery have been set on a broad silver band with embossing the gives the impression of handiwork. A bold Oriental style and an unusual combination of various coloured enamel. It goes with ethnic-style clothes or a bulky knitted dress.